Heat oven to 350°F. In large bowl, mix Meatloaf ingredients well. Press mixture in ungreased 8x4-inch loaf pan. Bake 40 minutes. Remove from oven. Spread 1/4 cup ketchup evenly over top. 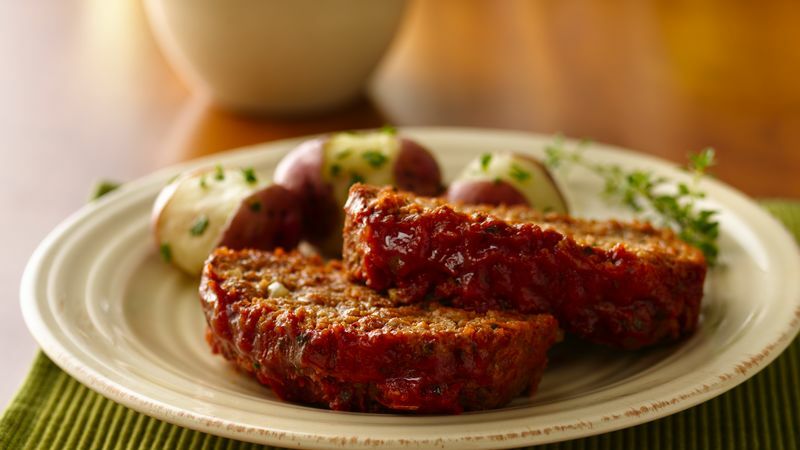 Bake an additional 15 to 20 minutes or until meat thermometre inserted in center of loaf reads 160°F. Let stand 10 minutes before serving. Use Italian style bread crumbs in place of the plain bread crumbs, and omit the Italian seasoning. Make-Ahead Tip Prepare and shape the loaf in advance; cover and refrigerate up to 5 hours. Bake just before serving. Storage Tip Cover and refrigerate leftover meatloaf slices. To reheat, microwave each slice on microwavable plate uncovered on Medium-High (70%) 1 1/2 to 2 minutes.